The first Caplin Day was July 10, 2011, six months after Caplin died. By that time I had already adopted little Garibaldi Rous who was, by then, about a year and a half old. To celebrate I tried to feed him blueberries, one of Caplin’s very favorite foods, but he refused to eat them. Instead they all fell to the bottom of the pool. So the first Caplin Day was a bit of a flop. 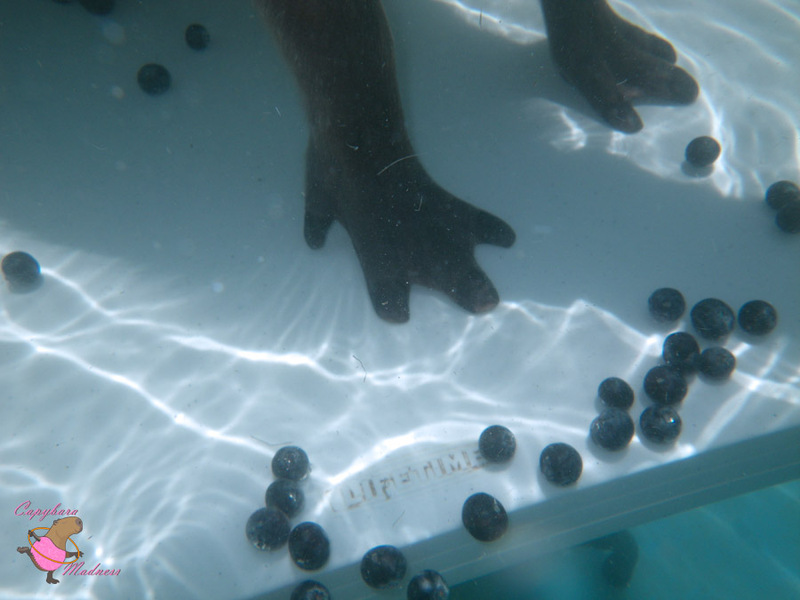 Remember, eating blueberries is one of the accepted ways to celebrate Caplin Day! Spinach is also a possibility because Caplin ate spinach as a treat. The Popeye of capybaras! The second Caplin Day went better than the first. We celebrated with popsicles in the pool. Turns out Gari liked a nice fruit popsicle on a hot summer day. Popsicles are, of course, the number one food for celebrating Caplin Day. Caplin Day 2014 was sad. I had my brain hemorrhage on Oct. 16, 2013 and lost half of my vision, among other issues. The bright side, or so I thought, was that I would have a lot of time to spend with Gari. Gari had been having trouble with his teeth for over a year by that point, but the prognosis had recently taken a positive turn. With regular trimming by the vets up at Texas A&M, his issues could be kept under control. Only that’s not the way things turned out. On February 16th, just short of his fourth birthday, Garibaldi died due to an infection caused by the tooth that had caused him so much trouble. That was a terrible, terrible day. I was still recovering from brain surgery and struggling with my vision loss and now I was left alone with no Garibaldi Rous to help me through it. But Caplin Day cannot go uncelebrated. 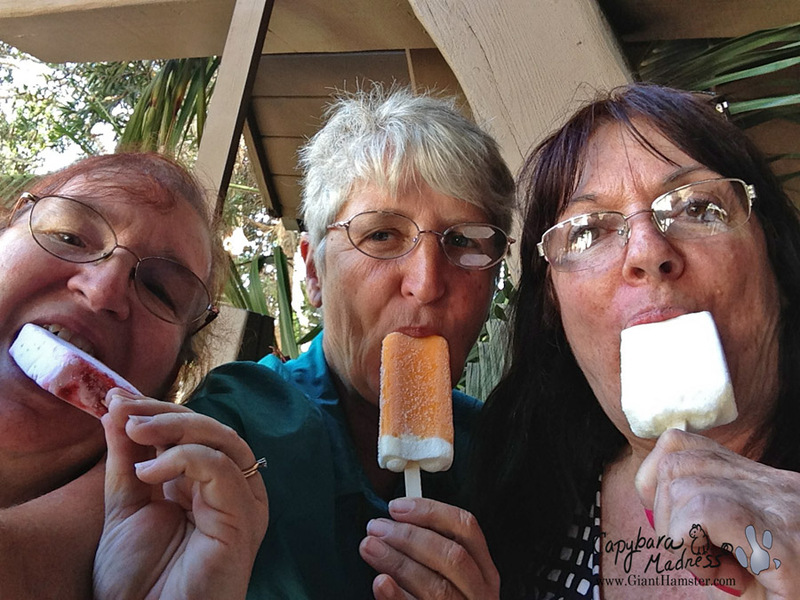 I ended up having popsicles with two friends from high school, who were now, like me, as old as dirt. 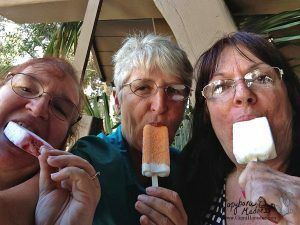 The popsicles that year and every year since are dedicated to both Caplin and Gari. That was the year without a capybara. A dark year. Mudskipper Rous was born on February 7th, 2015 and came to live with me on the 14th. 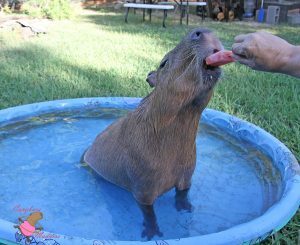 By Caplin Day she was a good sized six month old capybara. She got a homemade yogurt popsicle to celebrate the memory of both Caplin and Gari. I can’t believe I didn’t take any photos on Caplin Day but it looks to be true. Either that or I lost them. I was struggling with some issues at home at that time and still going through a lot with my brain issues. This is a photo taken on July 12. 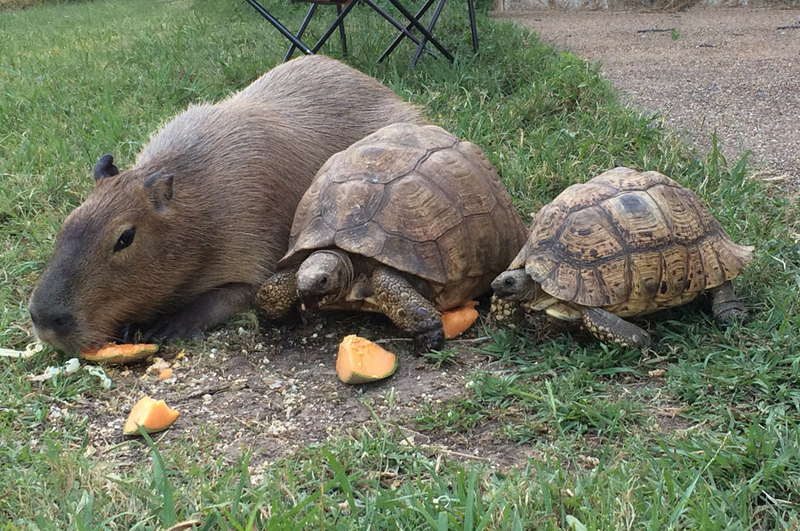 Skipper and the tortoises are sharing a pumpkin. Caplin and Gari inever ate pumpkin, it never occured to me to try it with them. Turns out, Skipper wasn’t excited about it, but it was a great treat for the tortoises. Mudskipper has always had some issues with water and swimming. She would never get in the above ground pool that both Caplin and Gari loved so much. That meant that instead of swimming, she had to eat her Caplin Day popsicle in her wading pool. Still cute and totally Skipper. This year we should be able to celebrate in her new in-ground pool. 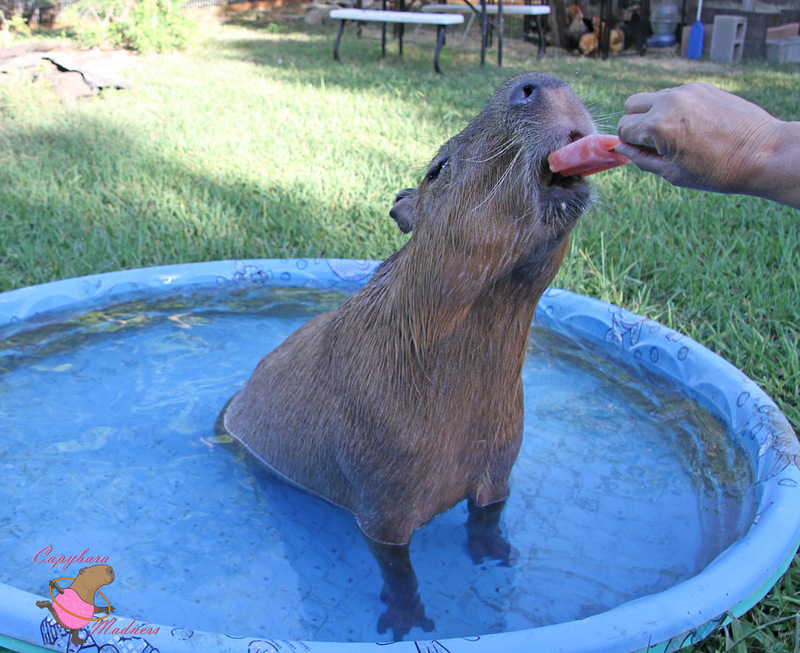 Darned spoiled capybara! We have now come to the conclusion of our historical summary of Caplin Day. I hope y’all have enjoyed it and are planning to celebrate this year. Leave a comment letting me know how you plan to celebrate. Make sure to take photos! I’ll have a little contest – with prizes! – for the best Caplin Day photo. Hello!! 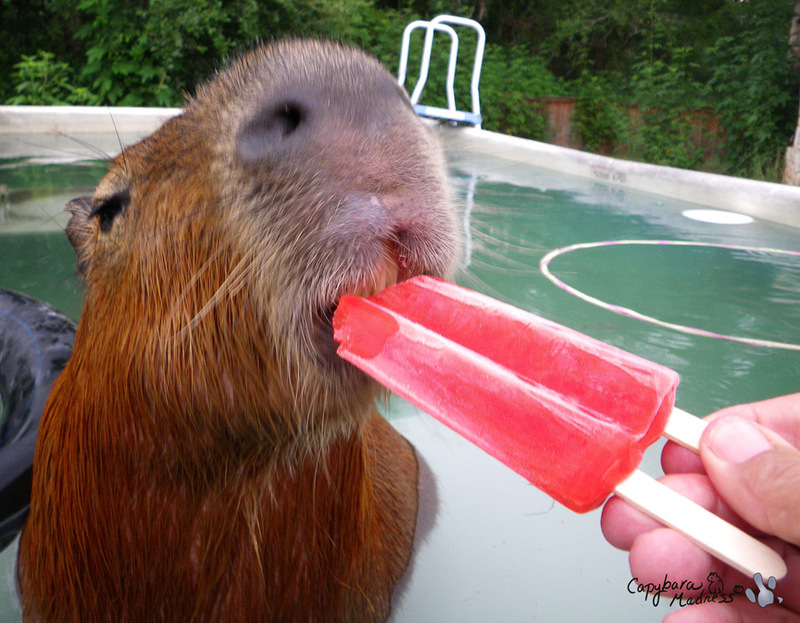 I plan to celebrate Caplin Day by eating popsicles while swimming, and take photos with my plush capys! 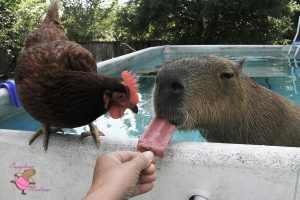 I just love capybaras so much!!! Caplin Rous may not be here physically, but in heart and mind, he is always there. The same goes for Gari and other capys that have passed on. Caplin, Gari and all the capybaras in the world have a special place in my heart, where they receive unconditional love. This website, blogs and all about capys means soooooo much to me. Reminding you that you are an inspiration. 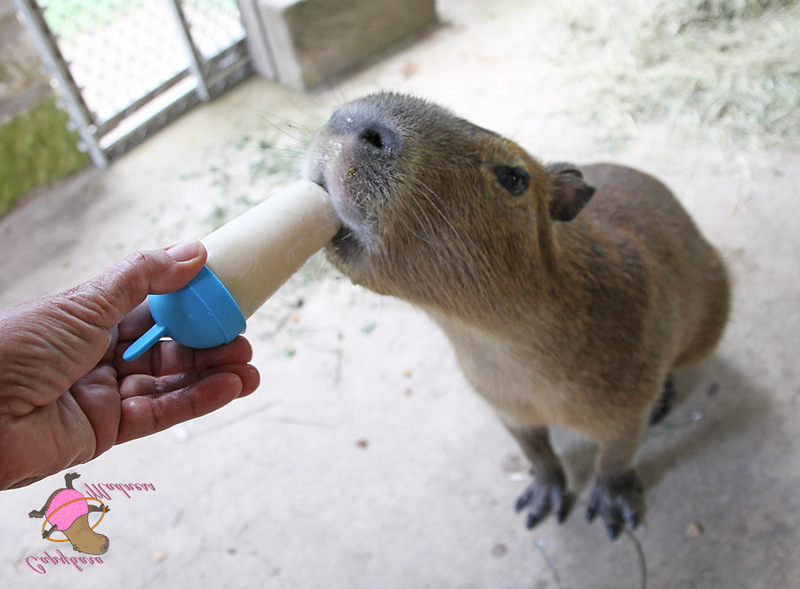 Thank you Melanie for all you have done with the capybaras and the ROUS foundation. Thank you so much. Have a blessed day and I wish you the best. Thank you. Gari and MelT taught me so much during his life. I don’t know Mudskipper very well but I know she’s super cute!